n. One venerated for experience, judgment, and wisdom. adj. sag·er, sag·est 1. Having or exhibiting wisdom and calm judgment. 2. Proceeding from or marked by wisdom and calm judgment: sage advice. Why did I start Sage Medicine? I have realized after practicing for 18 years that I am very particular about every aspect of my patient's health care. I genuinely enjoy the relationships that I have with patients and helping them with their health needs but do not enjoy the constant time pressure. Unfortunately medicine is changing. In the past, physicians could take more time with patients that needed a little more time because reimbursement for their time was better. Today, the payments from the government and the insurance companies have fallen to the point that financial reality requires that doctors see too many patients every day. This cuts into the time a doctor can spend with each patient. I have decided to add certain ancillary services into my practice that not only increase convenience for our patients, but also can help support the practice. This allows me to spend more time with my patients. I hope you enjoy your experience at Sage Medicine. My goal is to provide the best healthcare for my patients while providing them a great experience. 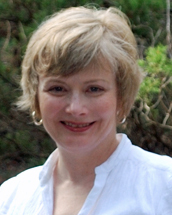 Dr. Cawley was selected by her peers as one of the top Internal Medicine physicians in San Antonio. 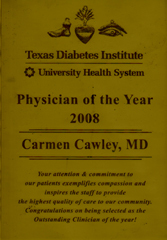 Dr. Cawley was chosen as the top clinician at the Texas Diabetes Institute.